The Central Coast of California is more than 200 miles long. Where can you camp on the beach? You might expect a long list to answer that question but in fact, you'll find only a few beachfront campgrounds between Santa Barbara and Santa Cruz. Blame Mother Nature if you're looking for a scapegoat: Most of that part of the California coast is lined with precipitous cliffs, not sandy beaches. By a strict definition of beach camping: at the beach, not across the road, down the street, or on top of a cliff, this list would contain only two locations. Because of that, the restrictions are relaxed to include a few places that are just a short walk away from the beach. If you want to camp in comfort at a Central Coast beach, but you don't have an RV, try Luv2Camp. They will deliver and set up something for you at Morro Strand or Port San Luis. For all of the state parks on this list, you can make online reservations up to six months ahead of time. That's trickier than it sounds, though and confusing and frustrating. Before you get lost in the state's reservation system, find out what you need to know about California State Parks reservations. Gaviota State Park: At Gaviota State Park, you have to walk across a parking lot and under a railroad trestle to get to the ocean from the campground. It only has 39 campsites, which can be reserved from Memorial Day through Labor Day. The campground is about 30 miles north of Santa Barbara, just off U.S. Highway 101. Morro Strand State Beach: Morro Strand is on CA Highway 1 near Hearst Castle. Small sand dunes separate their oceanside campgrounds from the beach. This state beach campground can accommodate camper vehicles up to 24 feet long. At hookup sites, they can go up to 40 feet. The hookup sites have full hookups (50 and 30 amps). Sites 41, 43 and 45 have views of Morro Rock but not the beach. You can have up to 3 licensed vehicles at your site. A trailer counts as a vehicle, but you can have one motorcycle in addition to the others. Dogs are allowed in the campground and on the roads, but not on the beach - and they must be on a leash. Morro Strand is a lovely place to camp, close to a three-mile stretch of beach with entrances at the north and south ends. Fishing, surfing, jogging, birding, and sunbathing are popular. Oceano Dunes, Pismo Beach: Oceano Dunes is the place in California that has beach camping like you might have imagined it. Vehicles are allowed to drive onto the sand along a 5-mile stretch of oceanfront, and you can set up to camp on the beach. The experience may be different than what you expect, though. It's often windy, and it's hard to keep the sand from getting into everything. Vehicles coming and going can be noisy. 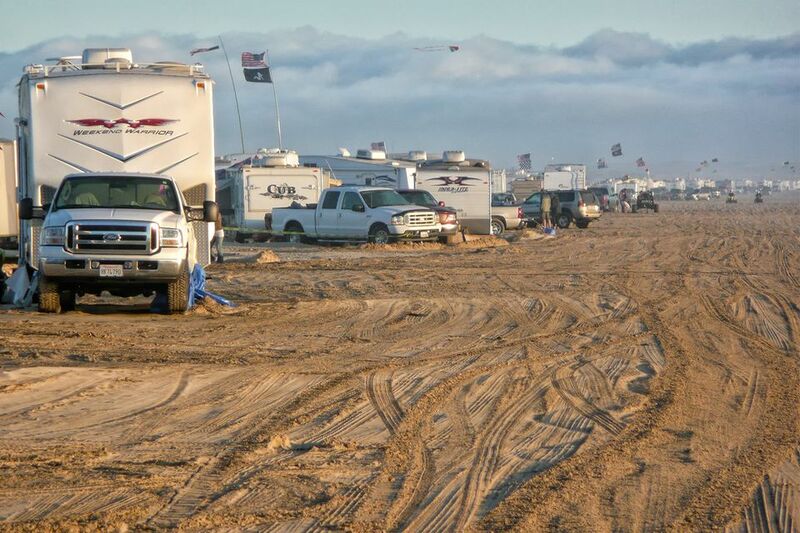 In spite of that, lots of people love to camp at Oceano, and many of them bring their families every year. Passenger cars can drive on the northern portion of the beach, but you really need a four-wheel-drive vehicle to get to the camping area. Port San Luis Campground: It's just north of Pismo Beach in the small town of Avila Bay, off U.S. Highway 101. It's for RVs only. Dry camping sites in their Nobi Point location are just above the beach. The hookup sites are across the street. This campground is not a state park but is run by the local harbor district. You can make reservations online at their website. Limekiln State Park: Limekiln is an especially scenic park with the only beachfront camping along the Big Sur coast. The ocean sites at Limekiln are very close to the sand, but there are only a dozen of them. They can accommodate vehicles up to 24 feet long (trailer up to 15 feet). You can reserve them ahead of time - and you should. Dogs are allowed on a leash. The campground has restrooms and showers.